Home Basic Accounting What is Management Accounting? 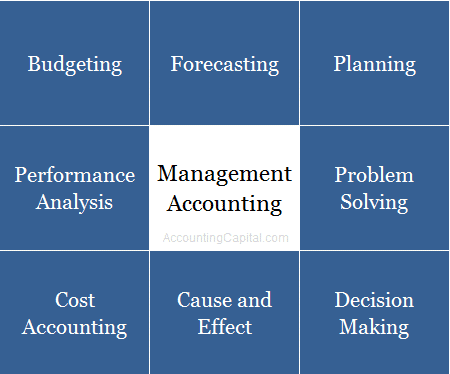 The word “management accounting” is a combination of two words “Management” & “Accounting”, in layman terms this means accounting for internal management. Also known as managerial accounting, it deals with generating financial information for business managers within the organization. The main purpose of management accounting is planning & decision making. In real life scenarios, this is achieved with the help of one or multiple ERPs as this is where all the financial data is stored. Some of the top financial ERPs in the world today are Quickbooks, E-Business Suite, PeopleSoft, Hyperion Financial Management, SAP, Tally, etc. Unlike financial accounting which is regulated and is available to both internal and external users of accounting, management accounting is confined to only internal users of information. Budgeting & Forecasting – This is one of the primary reasons why managerial accounting exists. Budgeting & forecasting is an integral activity of every business and it is entirely supported by management accounting. Performance Measurement – It helps with various operating activities which focus on the performance of a particular department, business segment, and/or the company as a whole. Performance can not only be measured but also be compared with previous accounting periods. Cost Accounting – Managerial accounting helps with cost control, cost reduction, product pricing, etc. Example – An estimated cost vs actual cost analysis is performed with the help of management accounting tools to ensure a cost centre is not overspending. Planning – Planning is a significant part of the decision making process. Planning can be operational, strategic, or financial. Combined with other sources of data, managerial accounting helps to achieve efficient planning. Solving Problems – Financial accounting is more about recording and reporting what has happened, whereas, management accounting is more about making decisions based on what happened. Facts and figures are gathered to identify problem areas and thereby to implement their respective solutions. Mgmt. accounting is acting on the basis of existing data to make futuristic decisions. There are more areas where managerial accounting may be utilized.